Melinda Loomis: The 2018-19 TV season has begun, and you know what that means! The 2018-19 TV season has begun, and you know what that means! It means that someone is going to suffer the humiliation of being the first cancellation of the season! And by someone, I mean one of the new network shows. I stumbled across a terrific website today that I'm boggled I haven't seen before: Television Obscurities, devoted to shows that crashed and burned upon launch, many of which are largely forgotten today. 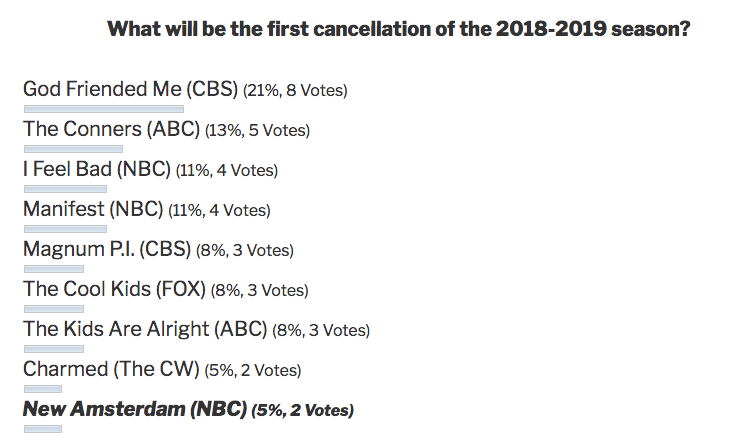 The site has a poll where you can vote on your choice for the first cancellation of the new season. I was surprised to have been only the second person to cast a vote for New Amsterdam. I'm all for helping people, but I've found the over-the-top do-gooding in their spots - which have been in heavy rotation - to be cringe-worthy, and I read a review of the pilot today that basically confirmed my reaction. Looks like a lot of people are convinced The Connors will crash and burn without Roseanne. I personally think it will do well early on (due to the curiosity factor of how they wrote out their star and rebooted the reboot) so while I don't think it will last, I don't think it will be first on the chopping block either. I was surprised that Manifest rated so high in the poll. NBC has been touting it as the most anticipated new drama of the season and I don't disagree with them. I did see the pilot last night and despite a bunch of less than enthusiastic reviews, was not disappointed. I especially did not see that ending coming. I actually think this will be one of the most successful new shows. Also not surprised by the Magnum P.I. 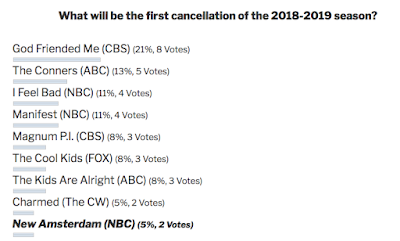 votes, although I don't see CBS being willing to cancel it early on even if the ratings tank, if for no other reason than to save face on what seemed to be a reboot no one was clamoring for but the network seemed hell-bent on making happen. Think you know the first show to die a horrible death this season? Get on over to Television Obscurities and cast your vote! Updated 9/26/18: Whoops! Looks like I was wrong about New Amsterdam!